It’s 2008: You’re reading Objective-C tutorials on Cocoa Dev Central, Lucida Grande is the system font and ARC doesn’t exist yet. You want to write a nice, native Cocoa application. Where do you start? argv is the program name, so the first argument starts at argv. 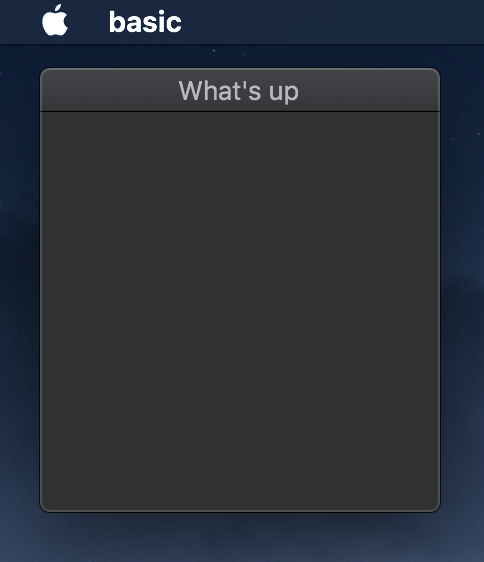 C is great and all, but what if we want to start interacting with OS X? We can do more interesting stuff with libraries. Libraries on OS X come in two flavours, static and dynamic. We’ve successfully compiled our code into an object file, a.k.a. machine code that Mach based kernels can understand. The -c flag passed to clang tells it to only compile it: by default it will also try to link it too, but we’re going to do that by hand. objdump -d disassembles the object file so we can look inside. 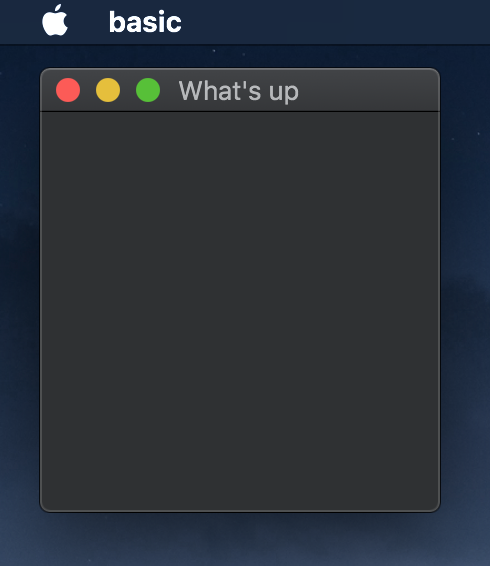 Here, foo.o has one symbol exported: _add. Now say we want to reuse this function in an executable. Without having the object file, we can compile our executable as long as we tell the compiler what this function looks like via a header file. The command above links the foo object file, main object file, as well as the C standard library that contains the printf function that we use. (It’s a dynamic library - we’ll see more of them shortly) Now if we run objdump -d a.out, we can see that foo.o has been copied into a.out, and our <_main+0x17> has been replaced with <_add>. What if we want to further expand our rich suite of arithmetic functions in our library, and include a sub function, compiled into another object file? -L. tells clang to look for libraries inside the current directory, ., and -lfoo tells it to load the library called libfoo. You’ll see this lib prefix all over the place, especially inside /usr/lib/. Often we don’t want to copy over the library code into our executable. 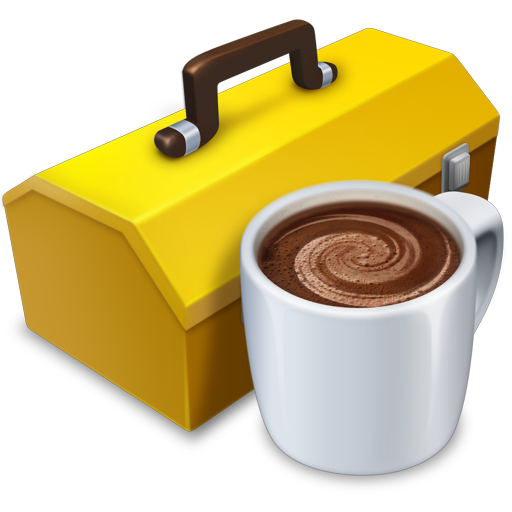 If every app on OS X did that then you would find yourself with a lot of duplicate functions from Cocoa. Instead we can use a dynamic library, where our executable just points to the library containing the Mach-O code whenever it needs to call a function. The first parameter of CFStringCreateWithCString is a CFAllocator (whatever that is), but thankfully we can leave it as NULL to use the default one if we don’t want to deal with it. You’ll see this happening with some other CoreFoundation APIs. Anyway, we’ll need to link the CoreFoundation framework when we compile this time. OK cool, but why did we need Core Foundation for that? Let’s do something a bit more interesting. ./a.out "one hundred and sixty-three"
Try changing up the locale. CoreFoundation isn’t just for working with strings, it provides a host of powerful APIs for working with locales, formatting, dates/times and more. To be safe we should analyze our code. Oh right, this is C so we need to keep track of memory ourselves. We’ll need to release anything we create otherwise we will end up leaking memory. Clang also helpfully pointed out that we were trying to get a 64 bit integer from CFNumberRef into a 32 bit int, so let’s fix that. Cool. Repeatedly running these clang commands is starting to get tedious, we should make a makefile. But what if we want to compile something other than search.c? Let’s make this more general. % is a wildcard (think *), and inside the rules $@ and $< get replaced with the destination and dependency respectively. Nice and reusable. A nice thing is that if we run make main again and none of the dependencies have changed (i.e. main.c), make won’t bother rebuilding it. Time to write some Objective-C.
There’s a lot going on here so let’s take a deeper dive into some of the methods. objc_allocateClassPair and objc_registerClassPair create a new class that subclasses a given class. We give it a name too. The 0 at the end for is how many extra bytes we want for ivars (instance variables), which we don’t have any of. It returns a Class. class_addMethod takes a class and adds a method to it. You need to specify the selector (SEL) for it, which is kind of like a name for it. sel_getUid gives us one from a string. The implementation (IMP) is a function pointer, and in Objective-C all methods need to take in an object and a selector as the first two arguments. The first one is an object (id), and it’s self - that self keyword you’ve been using has actually been a parameter all this time, just like in Python. On the other hand _cmd is not so common. It contains the selector of the method that is being called, which may seem kind of pointless. 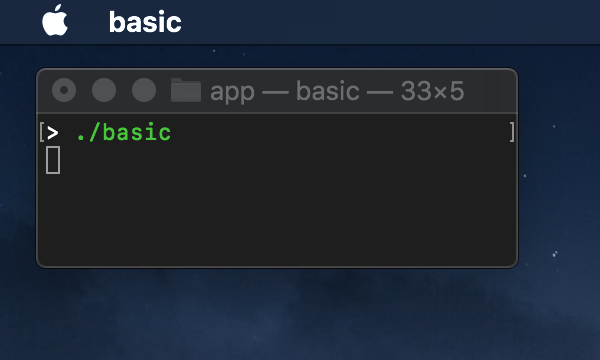 However, one of the wierd advantages of Objective-C being super dynamic is that you can “swizzle” methods and swap out their implementations, and the _cmd parameter lets you know what the original method that was being called before you hijacked it. The last parameter is the type signature, which we specify with this encoded string thing. The first character is the return type, and * represents char*. Every character after that is an argument. @ is an object for self, : is a selector for _cmd and i is our humble int, x.
objc_msgSend takes an object and sends a message to it at a selector, along with any arguments. It’s what happens when you call a method like [obj bar:42];. You might have noticed when call a class method like alloc, we pass in a Class but just cast it to an object, id. That’s because in Objective-C, classes are objects. 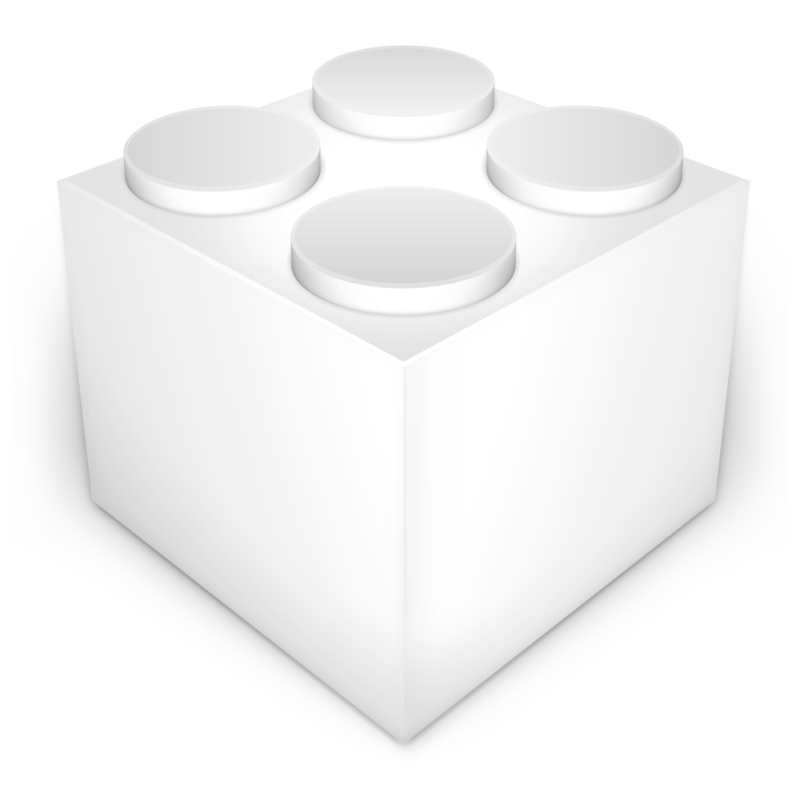 You may have spotted that at the top of the Objective-C code we use #import. It does the same thing as #include but won’t include files more than once, so we don’t have to worry about recursive includes. We also no longer need to import the runtime headers since we’re no longer directly calling objc_msgSend, but instead we need to import the headers for NSObject. If you’ve written Objective-C before, you’ve probably inherited from NSObject all over the place without ever having to explicitly import it. That’s usually because importing an Objective-C framework such as Foundation will include it for you. Speaking of which, have you ever wondered why we always inherit from NSObject? As it turns out NSObject provides lots of boilerplate methods like alloc and init, as well as the methods described in NSObjectProtocol. NSObjectProtocol describes a bunch of functions that the runtime needs to query information about your class, stuff like what selectors it responds to, what its subclass is and so on. So if your root class doesn’t implement this, be prepared for snarky error messages from the runtime and a generally bad time. You can implement this yourself but its not a great idea unless you really know what you’re doing. Hence why we usually let NSObject take care of this. But none of this takes advantage of Objective-C. And thats where Foundation comes in. Foundation, the sequel to CoreFoundation and the prequel to Cocoa, is the Objective-C framework that provides all of those NS classes you know and love. Most of these NS classes build on top of the underlying CoreFoundation structs that we saw earlier, by providing Objective-C classes and methods for them. On the side, if you’ve programmed in Objective-C before, you may have noticed we’ve been avoiding NSLog. This is because I personally find its purpose is for logging error messages, not for debugging or user facing output. You also get some extra garbage in the output and it ends up being written to the system console which is a bit overkill for our purposes. The -g flag was also added to have the compiler output .dysmb symbols: these will be helpful when using external tools to debug and investigate our code later on. Now let’s start leaking memory! Check out those cool new measurement APIs! Alas, we are leaking the NSMeasurements we alloc inside measureString. 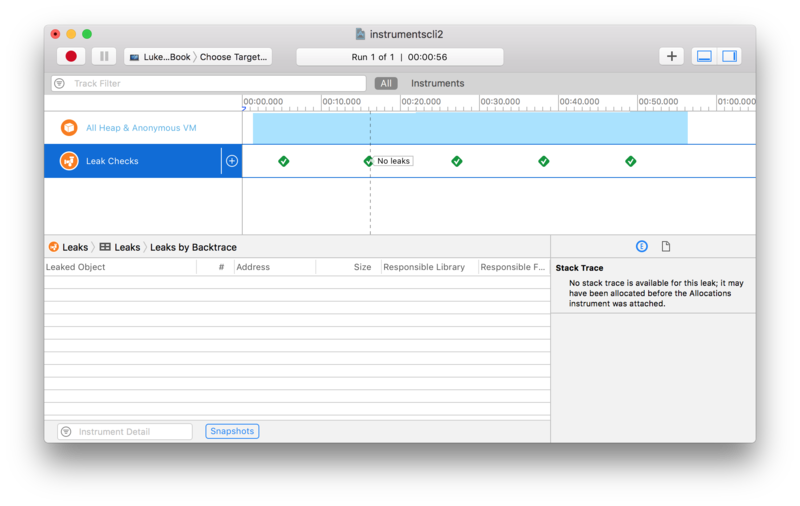 We can check for leaks using Instruments, which comes with Xcode. Now we’re talking. Around 2000 leaked objects, all NSMeasurements. 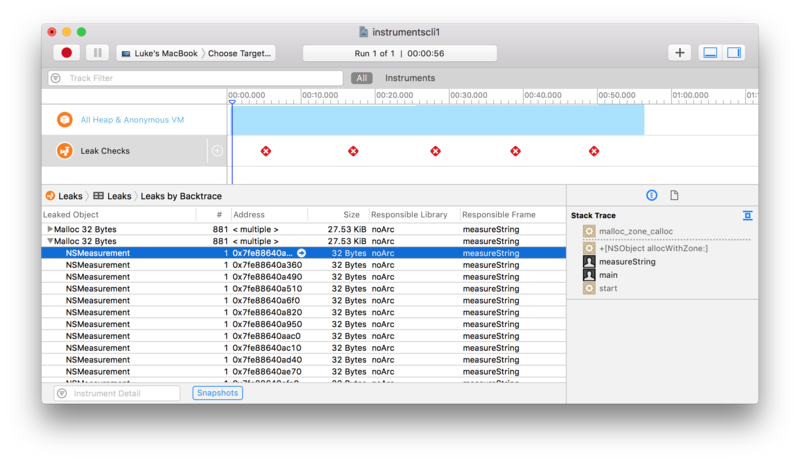 Instruments has lots of wild tools and features for debugging, like a side-by-side dissaembly viewer and even an instruction set reference built right in. But that’s for another day. So how come we’re leaking memory anyway? With Core Foundation, any “ref” type we created we needed to call CFRelease on, once we were finished with it. In Objective-C, any object we allocate ourselves with alloc, we need to release with release once we’re done. We want to store a variable in Counter, so we give it an ivar (instance variable) count. Just like in other object-orientated languages, we can encapsulate it by providing getter and setter methods. And the setter too, right? Great! Don’t worry, this will work when count is nil since Objective-C lets you call methods on nil perfectly fine (I don’t know if this is a good thing or not). Now to try it out. ==3628==The signal is caused by a READ memory access. Whenever its reference count reaches 0, it is deallocated, which is why so far we’ve been deallocating objects by calling release on it just once. By retaining value we increase the reference count by 1 to 2, so that when we release it from outside it drops back to 1, preventing it from being deallocated. We have to be careful to call [value retain] before we call [count release], because if count and value both point to the same object then we could inadvertently deallocate it by releasing it down to 0. But rather than worrying about this, we can use [value autorelease] which will defer calling release until the current autorelease pool is released. retain also returns self which can be used to make our setter a bit more succint. But what’s an autorelease pool? Usually we don’t need to worry about autorelease pools though - In a full Cocoa application NSRunLoop will automatically call it every frame, but we will get to that later. Nice! We’re also specifying that we want the setter to retain whatever’s passed to it with the (retain) part. But we’re not just done yet - what happens when Counter gets deallocated itself? When using @property, clang will default to naming the ivar _foo, but you can also choose what it will be named with @synthesize. Finally, if you try to access n afterwards Address Sanitizer will trap, so we know it’s been successfully deallocated! Fast-forward to 2009: Automatic Reference Counting (ARC) is here! It takes care of all of that memory management headache for us. When its enabled, calls to retain and release are automatically inserted by the compiler. It’s enabled by default: Turning it off is a very bad idea™. Everything from here on in will be with ARC. Foundation: NSObject and friends that we just saw in the last section. 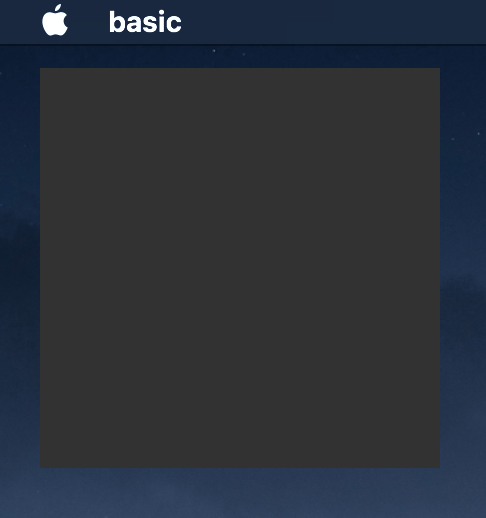 AppKit: Classes such as NSApplication for GUI. Core Data: An object persistence framework. Fancy term for saves objects to disk. If you take a look at the Cocoa framework under /System/Library/Cocoa.framework, it’s only 39KB. Compare it to Foundation’s hefty 18.6MB, or AppKit which weighs in at a whopping 63.3MB as of 10.14. And now we have an app running! But there’s nothing in the dock. By default applications have an NSApplicationActivationPolicyProhibited activation policy, which means that they can’t create windows or have menu bars. We need to set this to the regular policy which does allow us. While we’re at it, lets also automatically activate the app so it is front and center when we launch it. Now how do we get out? NSMenuItem *quitMenuItem = [[NSMenuItem alloc] initWithTitle: @"Quit"
We can programatically create menus with the NSMenu and NSMenuItem classes. The main menu bar is an NSMenu itself, as well as all its other submenus. 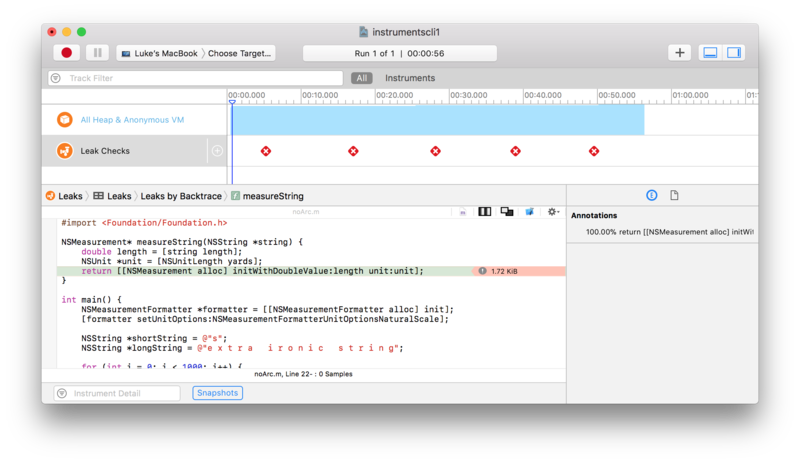 You may notice SEL from earlier, the type for efficiently referencing Objective-C methods. In the code above we used @selector(terminate:) to create one for us, which in this case references a method on NSApplication. cascadeTopLeftFromPoint: positions the window from the top left of the screen with a bit of offset, which is nicer than our default absolute bottom left of (0, 0). initWithContentRect: This is simply the size and position of the window when we first create it. backing: All but one of the possible enum values are deprecated so we don’t really have a choice for this. It controls how the window is drawn, and has options for back in the day when memory was tight and CPUs had framebuffers. defer: Waits until the window is moved before doing some work with window devices. Turning it on saves some memory. The result is fairly spartan. What about the just NSWindowStyleMaskTitled on its own? It starts to look pretty good! We get the traffic lights, resizing and even full-screen. NSButton *button = [NSButton buttonWithTitle: @"Get the Time"
Note that unlike UIKit, there is no such class as NSLabel, NSTextField can act as both a readonly label and an editable field by setting specific properties. labelWithString: is a shortcut to create an NSTextField with these properties. Yikes, the views overlap. Now we could position them by hand ourselves with, setFrame:, but this is a pain. NSArray<NSLayoutConstraint*>* hConstraints = [NSLayoutConstraint constraintsWithVisualFormat: @"|->=20-[button]-20-[textField]->=20-|"
NSArray<NSLayoutConstraint*>* vConstraints = [NSLayoutConstraint constraintsWithVisualFormat: @"V:|-[button]->=20-|"
If you right click on any OS X application, you’ll see an option to “Show Package Contents”. 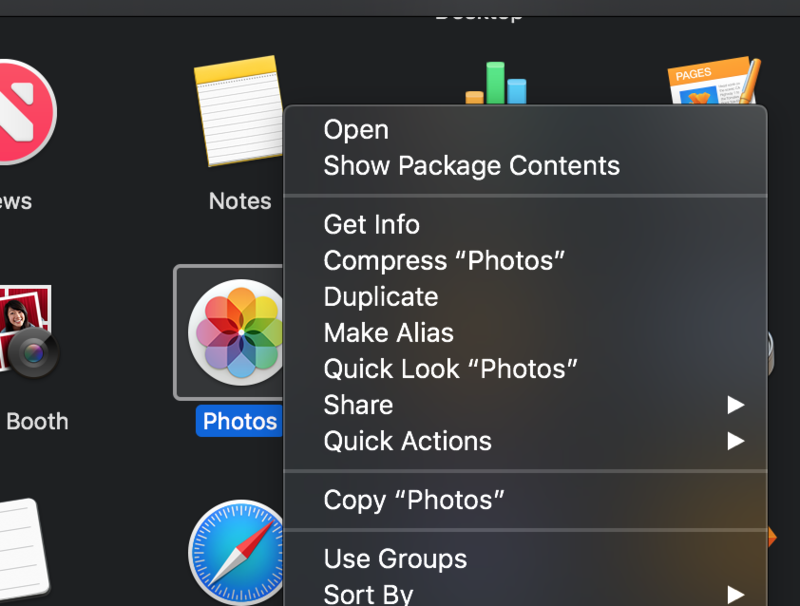 .apps are actually directories, but OS X hides the contents as if they were a single file because they are bundles. 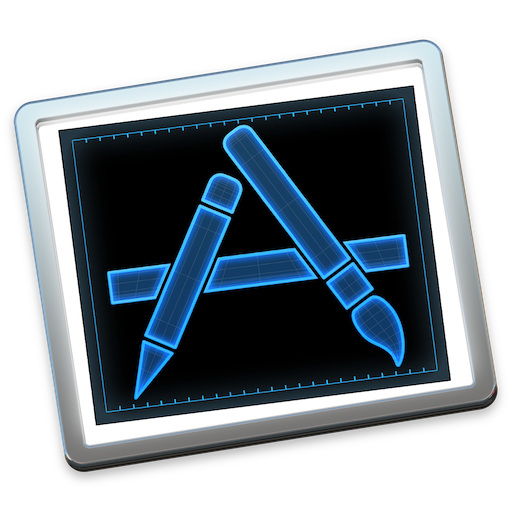 Frameworks, plugins, screensavers and more are all bundles too. Check out the NSBundle Foundation class for more information.